Maddie and I are working hard at establishing a good connection at the trot, and doing this has required me to do a few things. First and absolutely foremost, I’ve had to master the inside-leg/outside-rein dynamic. Sometimes bending into the outside rein is still difficult, but I’m getting it. And improving the use of my outside rein also means that I have to get off my inside rein. Mads likes to hang on the inside rein sometimes, which complicates things for me, because my instinct is to hang back. And the horse will always win that sort of argument – so avoiding it is important. This brings me to the third thing I’ve been working on improving – my responses. I understand that horses operate in the moment, and responding at a specific moment – whether you’re adding or relieving pressure – is key to riding successfully. Not only do you get a better response – encouraging the horse to round by giving your hands, or discouraging a behavior by driving the horse forward, for example – you also create a better horse – because every time you ride, you’re also training the horse. The closer you can get to offering the appropriate response to the moment, the better of you’ll both be. Here’s a good look at how not to do it. This picture shows Maddie braced against the inside rein, and I’m hanging back. Her nose is tipped inward, but there is no bend, no softness, no suppleness here. 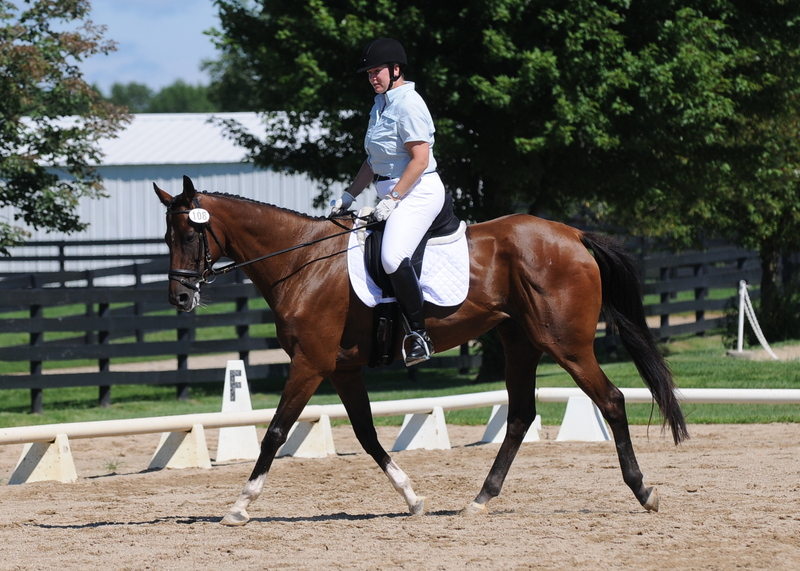 Her right shoulder is popping out, she’s not working over her back, and you can also see that the quality of the trot is pretty poor – I’ve put her onto her forehand, and she’s nowhere near tracking up – this trot lacks energy. In a word, it’s mess, and it doesn’t feel good to ride. When we’re this disconnected, it feels like Mads is a semi on a slick road – the front part of the truck is heading one direction, and the rear end isn’t necessarily following. So, as I mentioned, we’ve been working on developing good contact, and tonight we had it. She was giving me really solid contact in both reins (for the most part), which we developed using serpentines, changing the bend frequently. Suddenly, I had even weight in both reins, her back came up underneath me, and she rounded like I had never felt her round before. 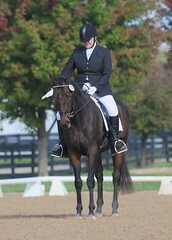 This trot felt powerful, balanced and responsive. We had energy, and she was tracking up. It felt like driving a sports car, because this big horse (she’s every bit of 16.3) was connected end to end – from her haunches, over her back, through her neck, into the bit, and into my hands. “That looks really good!” my trainer Christy called from the center. “When you come out of the corner, do a couple steps of shoulder fore, then leg yield to the wall.” I closed my fingers on the outside rein, and tightened the muscles of my inside leg. I pushed Mads with my left hip flexors, and she curved gently around my inside leg, continuing on a straight track down the quarter line. Breathlessly – and still holding firmly to the outside rein – I tightened my lower leg against Maddie’s side, and gave her a little nudge with my heel. Over we floated, without losing contact or cadence. “Yes! That’s it!’ came the cry from the middle of the ring. But this was one time I didn’t need Christy to tell me that we had done it right.